Colorado is the only state in history to turn down the Olympics. Denver was supposed to host the 1976 Olympics. 62% of all state voters chose at almost the last minute not to host the Olympics, because of the cost, pollution and population boom it would have on the State of Colorado and the City of Denver. In Fruita, the town folk celebrate "Mike the Headless Chicken Day." Seems that a farmer named L.A. Olsen cut off Mike's head on September 10, 1945 in anticipation of a chicken dinner - and Mike lived for another 4 years without a head. Leadville is the highest incorporated city in the United States at 10,430 ft. above sea level. Because there was lots of "silver" named towns at the time, the founding fathers suggested Leadville. Fountain has the distinction of being the United States' millennium city because it best symbolizes the overall composition of America. Fountain is the most accurate representation of the American "melting pot." Fountain was chosen after a Queens College sociologist crunched Census Bureau statistics in an effort to find the one city in the country that best represented the population make-up of the United States. Pueblo is the only city in American with four living recipients of the Medal of Honor. The aptly named town of Twin Lakes lays adjacent to two natural lakes at the foot of Colorado's highest fourteener, Mt. Elbert. 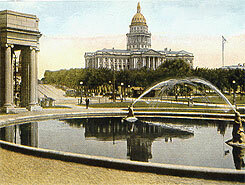 "Beulah Red" is the name of the red marble that gives the Colorado State Capital its distinctive splendor. 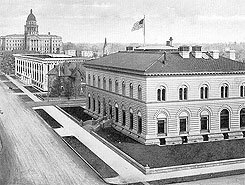 Cutting, polishing, and installing the marble in the Capital took six years, from 1894 to 1900. All of the "Beulah Red" marble in the world went into the Capital. It cannot be replaced, at any price. The "LoDo" region of Denver stands for Lower Downtown. Denver lays claim to the invention of the Cheeseburger. The trademark for the name Cheeseburger was awarded in 1935 to Louis Ballast. Every year Denver hosts The World's largest Rodeo, the National Western Stock Show. 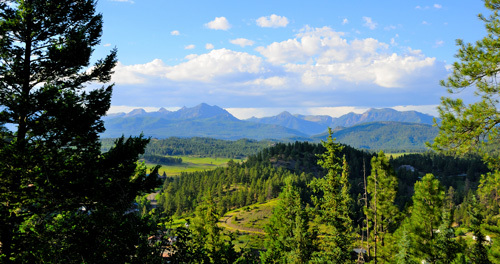 The Colorado Rockies are part of the North American Cordillera, which stretches 3,000 miles from Alaska, through western Canada and the United States, into northern Mexico. The centerpieces of this dramatic uplift are the peaks over 14,000 feet, or "Fourteeners," as they are affectionately named by climbers. 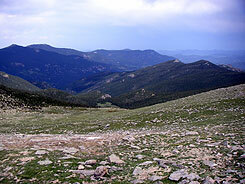 There are 52 Fourteeners in Colorado. 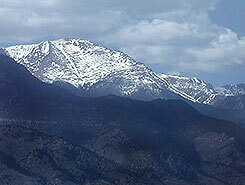 At 14,110 feet above sea level, over 400,000 people ascend Pikes Peak each year. 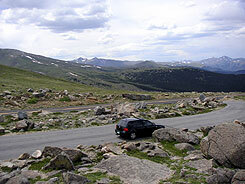 The Dwight Eisenhower Memorial Tunnel between Clear Creek & Summit County is the highest auto tunnel in the world. Bored at an elevation of 11,000 feet, under the Continental Divide, it is 8,960 feet long and the average daily traffic exceeds 26,000 vehicles. 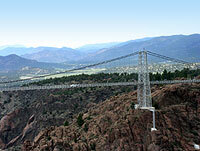 The United States Federal Government owns more than 1/3 of the land (15 million acres) in Colorado. The Bureau of Land Management controls more than 8 million acres of public land. The Colorado Division of Wildlife manages more than 250 public areas for hunting and fishing. 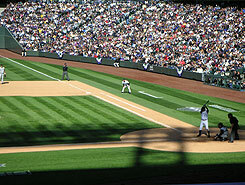 Of the 113 species of wildlife classified as sport game in Colorado, 105 are considered small game. Abundant nesting and migrating birds and other native animals provide a "world-class" watchable wildlife experience. Bald eagles and other raptors, sand hill cranes, shore birds and water birds can be seen seasonally at San Luis Lakes near Alamosa. Colorado is second in the nation for variety of birds. There are nearly 20 rivers whose headwaters begin in Colorado, with the Continental Divide directing each river's course. Colorado is the mother of rivers. Last year, the Division of Wildlife registered 46,000 off-highway vehicles to residents and about 7,000 to non-residents. That number grows by 20% each year. There are 15 national forests within the state of Colorado, 42 state parks, 4 national parks, 8 national monuments and 2 national grasslands . The tallest sand dune in America is in Great Sand Dunes National Park outside of Alamosa. This bizarre 46,000-acre landscape of 700-foot sand peaks was the creation of ocean waters and wind more than one million years ago. Mesa Verde features an elaborate four-story city carved in the cliffs by the Ancestral Pueblo people between 600 and 1300 A.D. The mystery surrounding this ancient cultural landmark is the sudden disappearance of the thousand of inhabitants who created the more than 4,000 identified structures. Florissant Fossil Beds National Monument near Cripple Creek is a lesson in history set in the one-time shadow of the Guffey Volcano. The Volcano erupted millions of years ago, creating fossils and leaving the valley filled with the petrified trees. Colorado's first and oldest military post, Fort Garland, was established in 1858 and commanded by the legendary frontiersman, Kit Carson. In 1859, John Gregory discovered "The Gregory Lode" in a gulch near Central City. Within 2 weeks, the gold rush was on and within 2 months the population grew to 10,000 people in search of their fortune. It came to be known as "The Richest Square Mile on Earth." 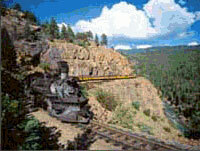 Glenwood Springs was a favorite stop of former president and hunting enthusiast Teddy Roosevelt. It was in this town where the teddy bear got its name. Altitude can produce some unusual effects such as dizziness, nausea, and headaches. Make sure you travel with a companion and know the early onsets: severe coughing, wheezing, shortness of breath, or chest pain. If you notice any of these symptoms, get that person to a lower altitude as quickly as possible. If you adopt the proper attitude toward Colorado's altitude, you and your family will have the most enjoyable vacation experience possible. There is an average of 30 degrees difference between low temperatures at night and high temperatures in daytime. Dress in layers! We have a saying in Colorado: "If you don't like the weather, wait 5 minutes!" If your dog seems sluggish in the mountains, know that dogs do not automatically adjust to higher altitudes. Like humans, pets should be given time to get used to the thinner air. Give your dog lots of water, and while hiking, be careful of overheating. If your dog lags behind or its tongue hangs out, your dog is overexerted. Let the dog rest. If hiking away from water, carry a water bottle for your dog. Note: Dogs can get giardia drinking from streams. Check with your vet for giardia shots. Also be sure to watch your dogs paws. Hiking in the woods can cause cuts, scrapes and foot pad injuries. Carry an anesthetic and gauze or tape to bandage wounds. Cell phones don't always work in the mountains. If you have to use one for an emergency, a higher ridge-line will give you the best reception. (Just don't be on a ridge during a thunderstorm!) If you call 911, tell them where you are (ie: what trail, park, peak or county). Depending on where you are, you may reach an emergency center for a different county. Use your ashtray. Colorado state law states that anyone who throws a lit cigarette or other burning material from a moving vehicle faces a fine of up to $1,000 and could spend a year in jail. Triple civil damages can be charged for causing a wildfire. The drier climate, higher altitude, and different outdoor pollens can trigger allergic reactions. If you have allergies, always be prepared for medical emergencies. Carry antihistamines or other allergy medications with you at all times. LEAVE NO TRACE is a set of outdoor ethics to teach people about conservation of land and wildlife. PLAN AHED AND PREPARE. Know the regulations and special concerns for the area you visit. Prepare for extreme weather and emergencies. TRAVEL AND CAMP ON DURABLE SURFACES. Use established trails and campsites, rock, gravel, dry grasses or snow. Protect riparian areas by camping at least 200 feet from lakes and streams. DISPOSE OF WASTE PROPERLY. Pack it in, pack it out. Inspect your campsite and rest areas for trash or spilled foods. Deposit solid human waste in catholes dug 6 to 8 inches deep at least 20 feet from water, camps, and trails. Cover and disguise the cathole when finished. LEAVE WHAT YOU FIND. Preserve the past; examine, but do not touch cultural or historic structures and artifacts. Leave rocks, plans and other natural objects as you found them. MINIMIZE CAMPFIRE IMPACTS. Campfires can cause lasting impacts to the back country. Use a lightweight stove for cooking and enjoy a candle lantern for light. Where fires are permitted, use established fire rings, fire pans, or mound fires and keep fires small. RESPECT WILDLIFE. Observe wildlife from a distance. Do not follow or approach them. Never feed animals. Feeding wildlife damages their health, alters natural behaviors, and exposes them to predators and other dangers. Avoid wildlife during sensitive times: mating, nesting, raising young or winter. BE CONSIDERATE OF OTHER VISITORS. Respect other visitors and protect the quality of their experience. Be courteous, yield to other users on the trail. Step to the downhill side of the trail when encountering pack stock. Avoid loud voices and noises. Be sure to check out the Ultimate Beginner's Guide to Hiking before heading out on your next hiking adventure! RIDE ON THE RIGHT. Ride in the right lane and never against traffic, except when passing another vehicle, preparing for a left turn or avoiding hazards. Always ride with the flow of traffic. Ride on the paved shoulder whenever a paved shoulder suitable for Bicycle riding is present. RIDE SINGLE FILE. Ride two abreast only when no motor vehicle traffic is approaching within 300 feet (front and rear) or when all cyclists are in the shoulder. On curving canyon roads, play it safe and ride single file. OBEY TRAFFIC LAWS, SIGNS AND SIGNALS. Use hand signals to indicate left or right turns, slowing or stopping. USE LIGHTS! Wear headlights, taillights, and reflectors at night. Never assume motorists see you or that you have the right-of-way. Expect the unexpected; your first responsibility is to avoid a crash. RULES FOR MULTI-USE TRAILS: RIDING, SKATING AND WALKING. Travel on the right, single file, with the flow of traffic. Don't block the trail. Groups should be in single file when other trail users are present and should never use more than one-half of the trail to allow for the flow of traffic. Control your speed! Obey speed regulations. Slow down and use caution when approaching or overtaking other trail users. Who yields the trail? Before passing another trail user, be courteous and make your approach known. A friendly greeting "Hello passing on your left," or ringing a bell is considerate. Bicyclist, skaters, walkers and others yield to Equestrians. Bicyclist and Skaters yield to walkers. Bicyclists yield to skaters. Downhill users yield to uphill users. Faster users yield to slower users. Never spook animals. Leave no trace. Respect wildlife and plan ahead. Stay on existing trails and don't create any new ones. Pack out at least as much as you pack in. Today, only the black bear is known to exist in Colorado. Population estimates range from 8,000 to 12,000 bears. These bears can run up to 35 miles per hour, run up or down hills easily, and climb trees. Bears use trails just as people do since it's easier to travel on a trail than through underbrush. Being aware of tracks, droppings and other bear signs (claw marks on trees, rotten logs ripped apart and hair on tree bark from rubbing) will allow you to determine better the presence of bears. Bears may be active anytime, during day or night, most often during morning and evening twilight. Keep trash in bear proof containers or keep containers in a secure building. If bears are present, remove all bird feeders, including hummingbird feeders. Do not put fruit and vegetables in compost piles. Do not feed bears or try and approach them. Keep all lower level windows and doors tightly closed. If a bear enters your house open doors and do not get between the bear and its escape route. Don't leave food out when not in use. Store it in bear resistant storage unit, hard-shelled vehicle or car trunk. Keep your sleeping area, tent and sleeping bag free of food and odors. Don't sleep in clothes you cooked or handled game in. STAY CALM. If you see a bear and it hasn't seen you, calmly leave the area. As you move away, talk aloud to let the bear discover your presence. STOP. Back away slowly while facing the bear. Avoid direct eye contact as bears may perceive this as a threat. Give the bear plenty of room to escape. Wild bears rarely attack people unless they feel threatened or provoked. IF ON A TRAIL, STEP OFF THE TRAIL on the downhill side and slowly leave the area. Don't run or make any sudden movements. Don't climb a tree. SPEAK SOFTLY. This may reassure the bear that no harm is meant to it. Try not to show fear. IF YOU MEET A BLACK BEAR WITH CUBS, use extra caution. In contrast to grizzly bears, black bears normally do not defend their cubs aggressively, but still use caution. FIGHT BACK if a bear attacks you. Black bears have been driven away when people have fought back with rocks, sticks, binoculars and even their bare hands. We've all had it happen. You look up from the trail just in time to see an animal dive out of sight. The truth is, most animals see and hear us long before we catch their drift. Fortunately, there are simple ways you can help blend into an animal's surroundings. The ultimate wildlife watching experience is behavior watching - viewing animals without interrupting their normal activities. Air for featuring wildlife within its natural surroundings, not a full frame profile. Wear dull colors that won't contract with your surroundings. A wildlife encounter is a spectrum of sensations. Deepen awareness by tapping your sense of smell, taste, touch, hearing and sight. Look in high-visitation areas: trail intersections, perches, ledges overlooking open areas and drinking sites. Take note of the season and guess whether the animal will be searching for a mate, feathering a nest, fattening for the winter or preparing to migrate.